Between you, me and the fencepost I’ve been dreading the mortises in the bench top for the the legs. It just looked hard. No, that’s not quite right. It looked like something I couldn’t do without screwing it up. I finally decided I didn’t care if I screwed it up. So today I laid out the location for the first leg and started making chips. I drilled the holes halfway through the top first, then started chipping out the waste. That wasn’t too bad. The drilling was pretty simple, too. Then I flipped the bench over and did the same on the other side. This is a heavy piece of wood, probably 250 pounds. Or, I’m a lot weaker than I thought. Or, perhaps, both. 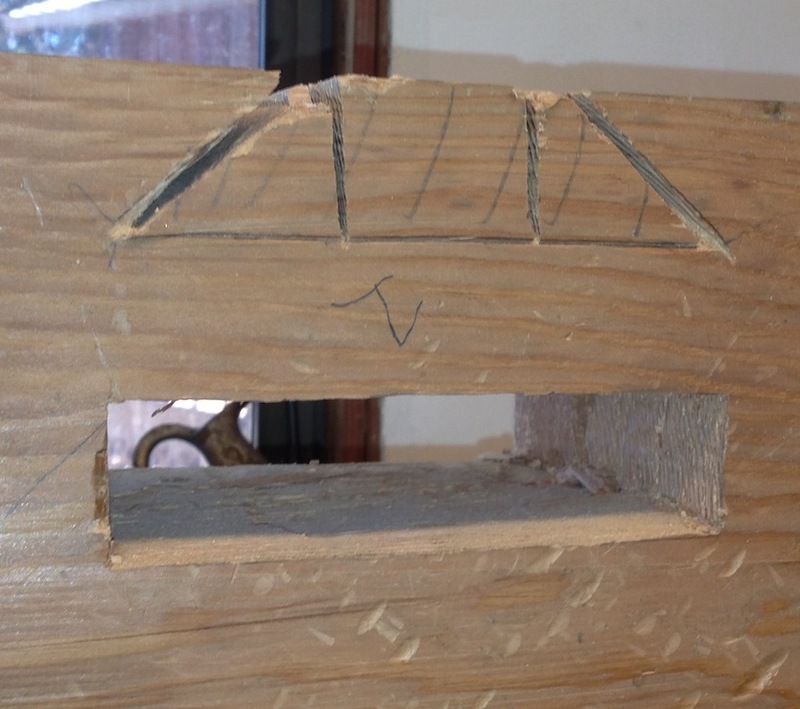 The mortise wasn’t too bad, but sawing the sides of the dovetail socket was a pain in the neck, Mostly because everything was wobbling, and I couldn’t get a decent stance. Once the sides were sawn it was easy to pop out the waste and pare the bottom (more or less) flat. And, viola, one leg fit. I did a little cleanup after this picture to get it to sit the rest of the way down, and to sit square to the surface of the bench. It’s slightly twisted, flush on one side and about 1/8″ proud on the other side. I’ll square the up as a last step before finishing. 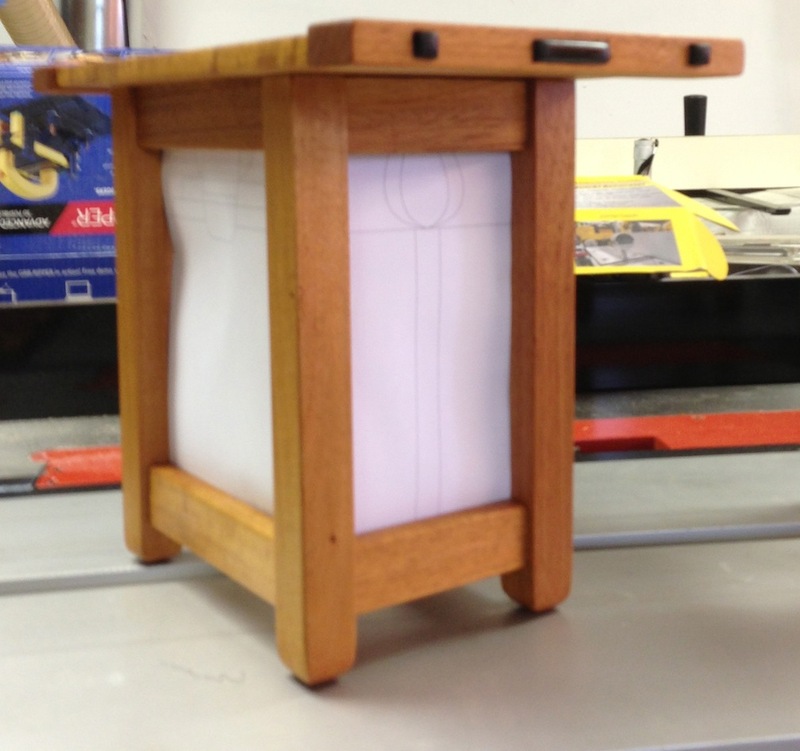 Now I need to do the other three legs, and stretchers, and the leg vise and I can put this thing to work. I’m going to have a bonfire with the old bench. 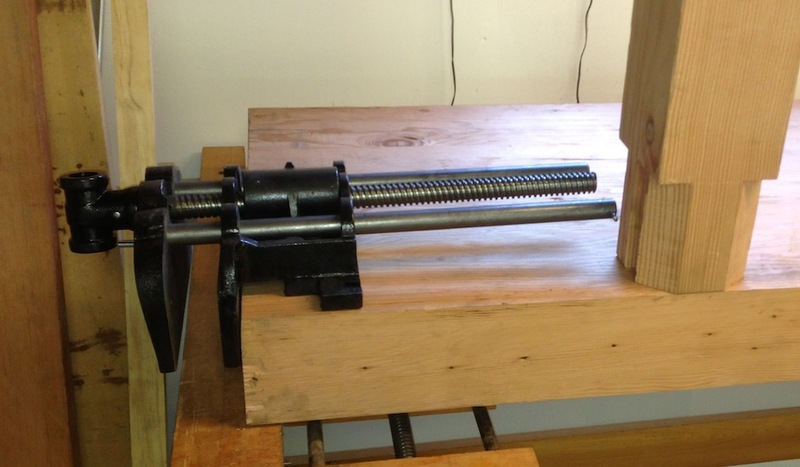 I got a little time in on my workbench project, and just about finished mounting the end vise. After turning lots of different options over in mind I decided to mount a standard (albeit heavy duty) Jorgensen face vise on the end of my bench. 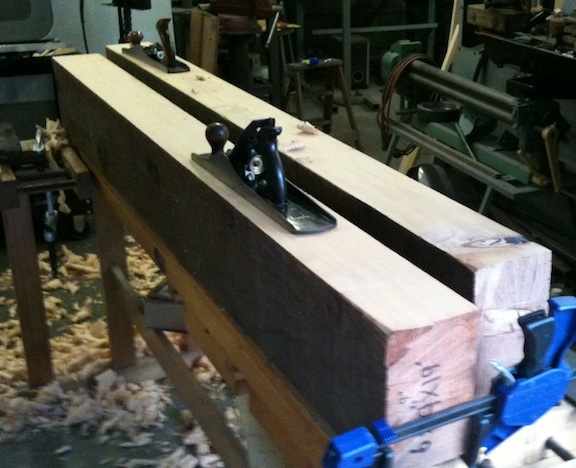 I’ll add a large chop to it to hold the bench dog similar to Chirs Schwarz did on his Cherry Roubo bench. 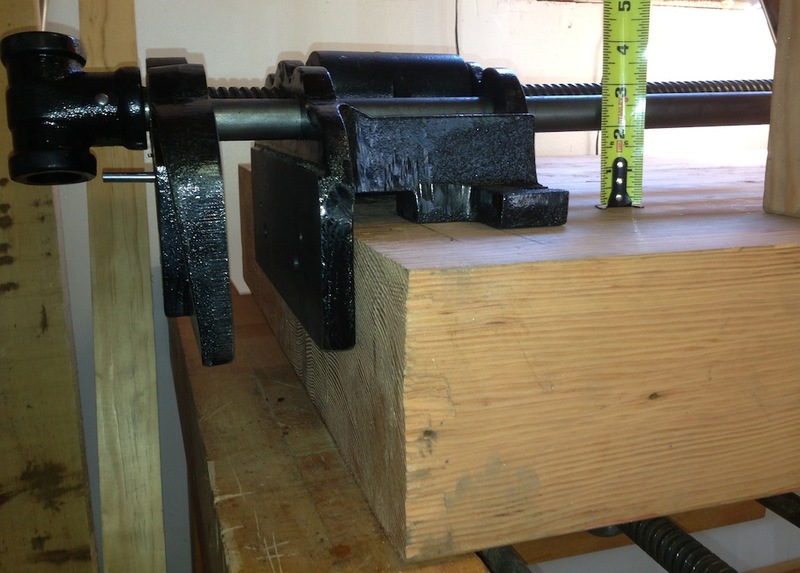 The first order of business was to figure out where to put the vise (other than on the end of the bench). 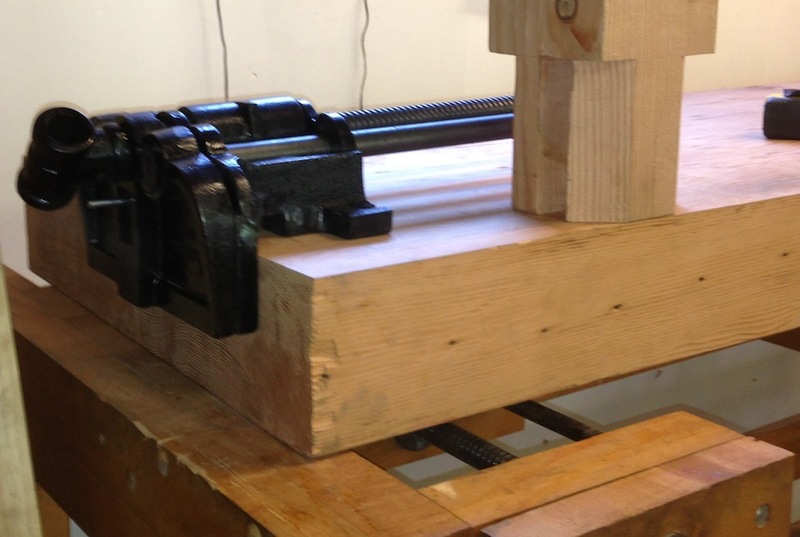 I thought about putting the vise right at the front edge of the bench. The downside is that then the closest leg needs to be shifted quite a bit inboard. I also wanted to recess the vise to minimize top-to-bottom racking, and the would leave an ugly gap in the front of the bench. 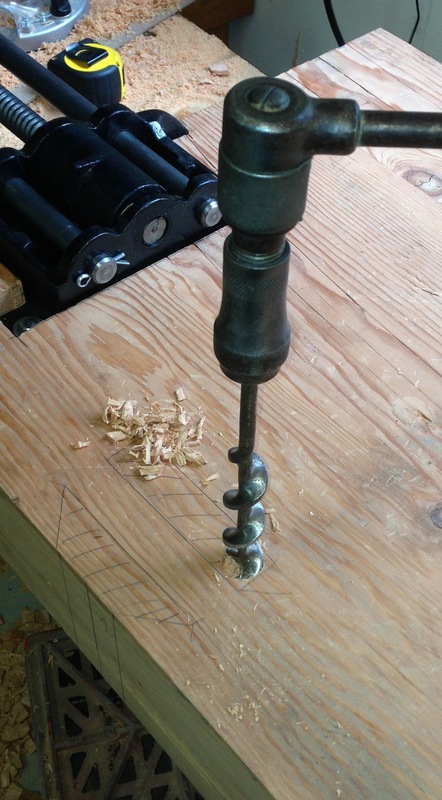 I played with all sorts of different positionings, in the end I set the vise about 3″ back , so I could move the leg back toward the end. I hope I don’t regret that later. Then I needed to decide how deep I should recess the vise into the bottom of the bench (that is, how close to the top I should move it). 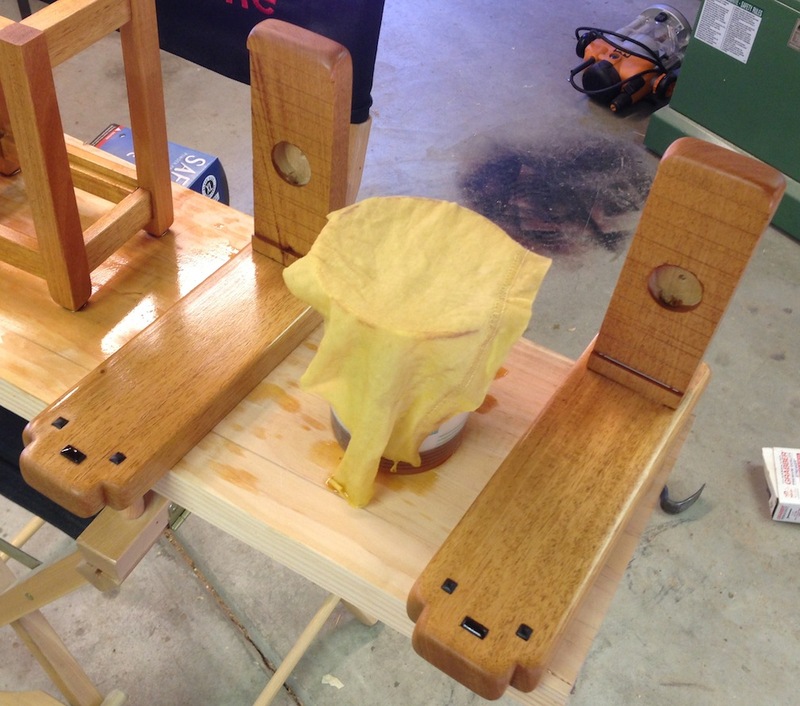 I wanted to minimize the stress on it when using it like a tail vise (where all the force will be cantilevered from the surface of the bench top), but I also didn’t want to weaken the bench in any significant way. I decided that 1.5″ looked about right. How deep to recess the vise? 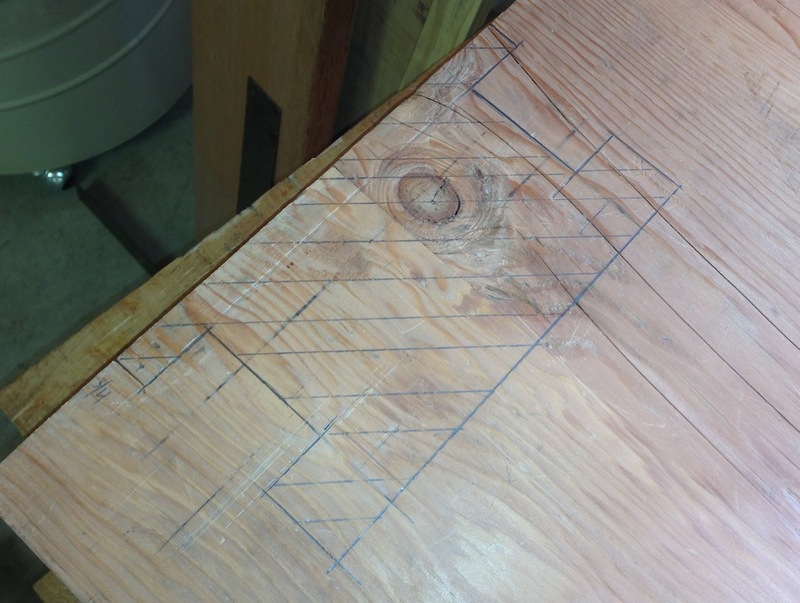 I marked out the area to be removed on the bottom and on the end of the bench. I removed the waste from the bottom using a router (gasp! ), it was quick and easy. 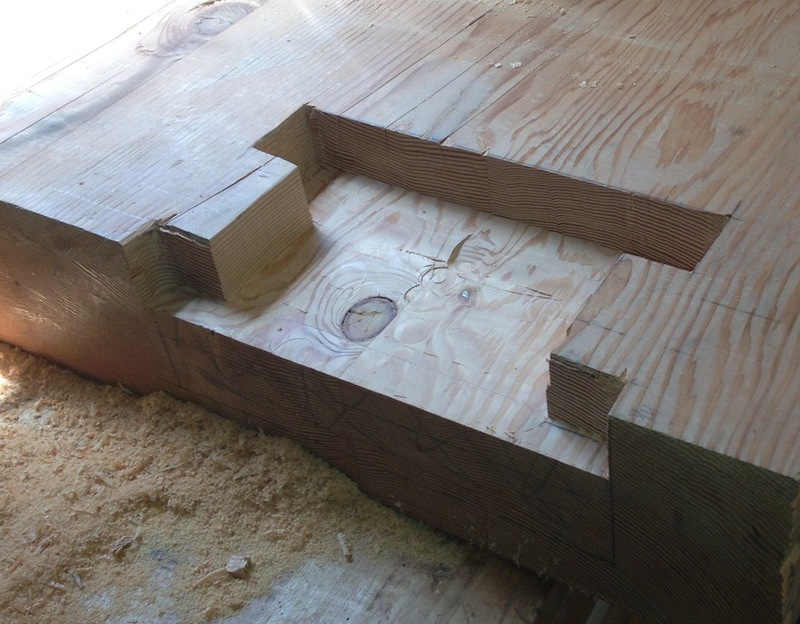 For the material on the and of the bench top — the recess for the inner vise face — I used a chisel and popped it out the same way you might on a dovetail. The vise dropped right in after a little clean up paring in a few spots. 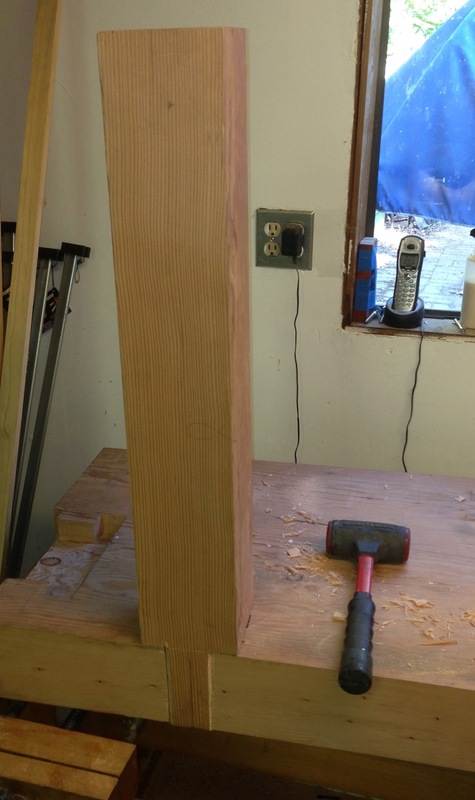 The next step is to cut the mortises for the legs into the bench top. I’m really nervous about that for some reason. 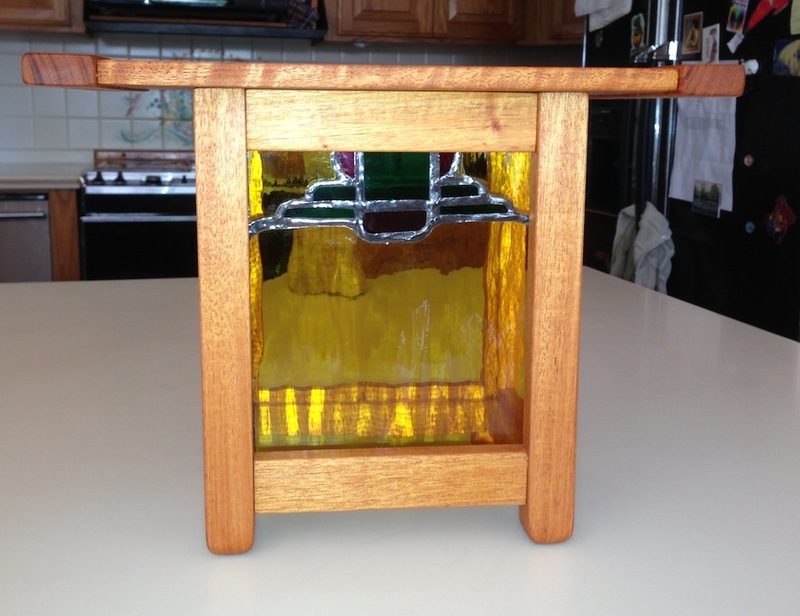 No woodwork tomorrow, Kolya and I are off to learn how to do stained glass at Kiss My Glass. 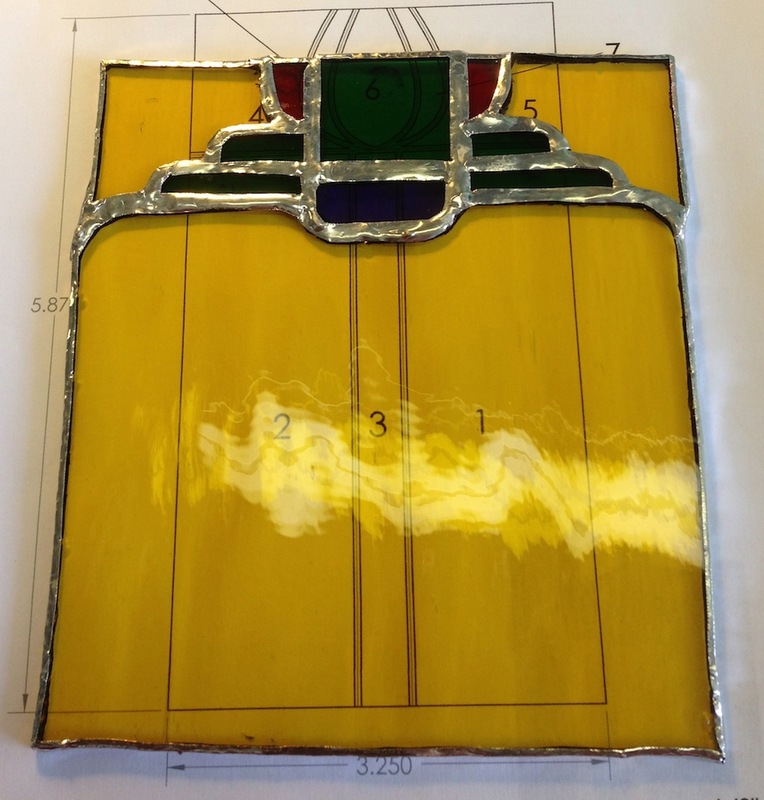 I’m hoping to be able to make one of the panels for my G&G sconces. but they have some fairly small parts and I might do better starting with a simpler pattern that I can finish in a day. About a year and a half ago I decided to do some woodworking, and with Roubo-styled workbenches all the rage that seemed like a good place to start. I picked up a 6×9 salvaged Douglas Fir beam and proceeded to hand plane three sections of it square and glue up a bench top. It was a unbelievable workout, complicated by knots and my inexperience with hand tools in general. 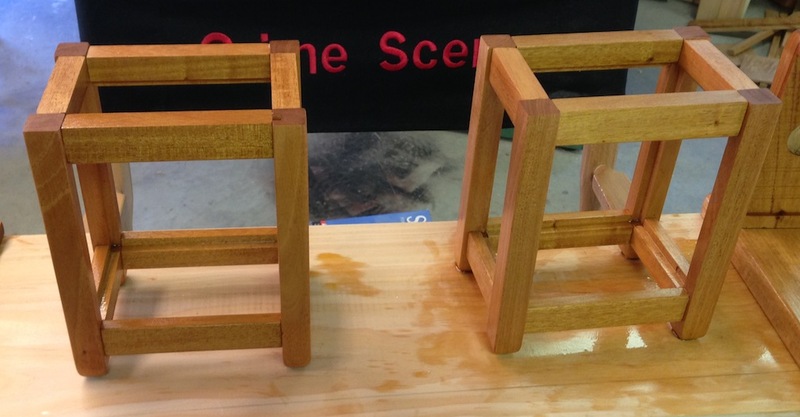 But I got all three pieces glued up, then squared up the entire slab on all six sides. No One Mentioned Workshop Aerobics! Anyway, today I spent a couple of hours organizing my shop spaces. 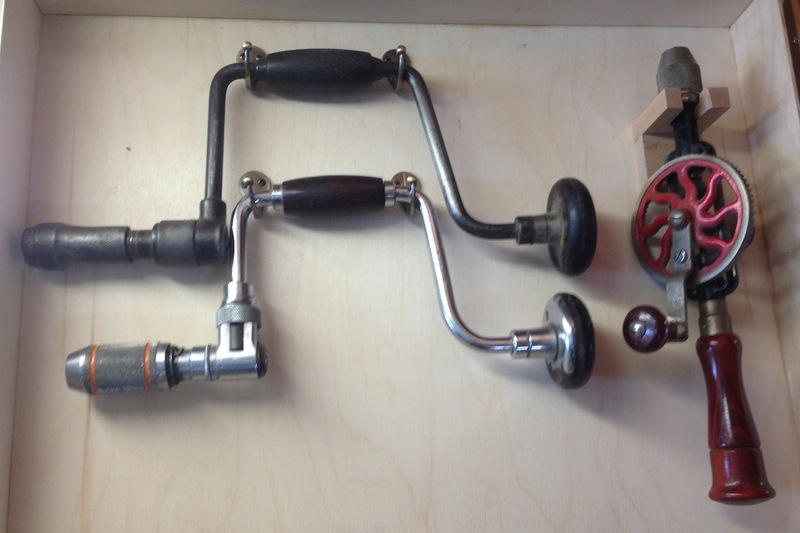 I moved the blacksmithing power hammer to the metal shop, and moved my $75 wood lathe to the wood shop. Parts for cars that I want to build someday were hoisted into the attic space in the metal shop. 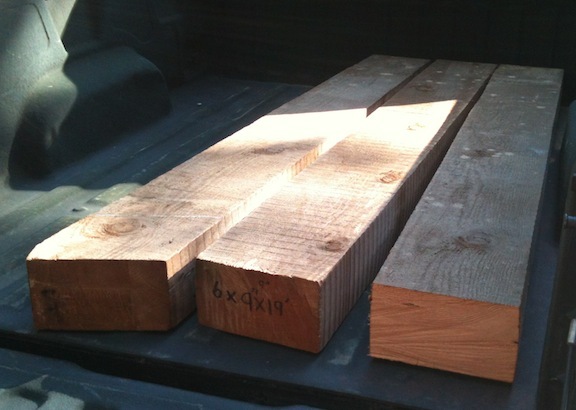 And the parts for the Roubo bench were hauled to the wood shop. 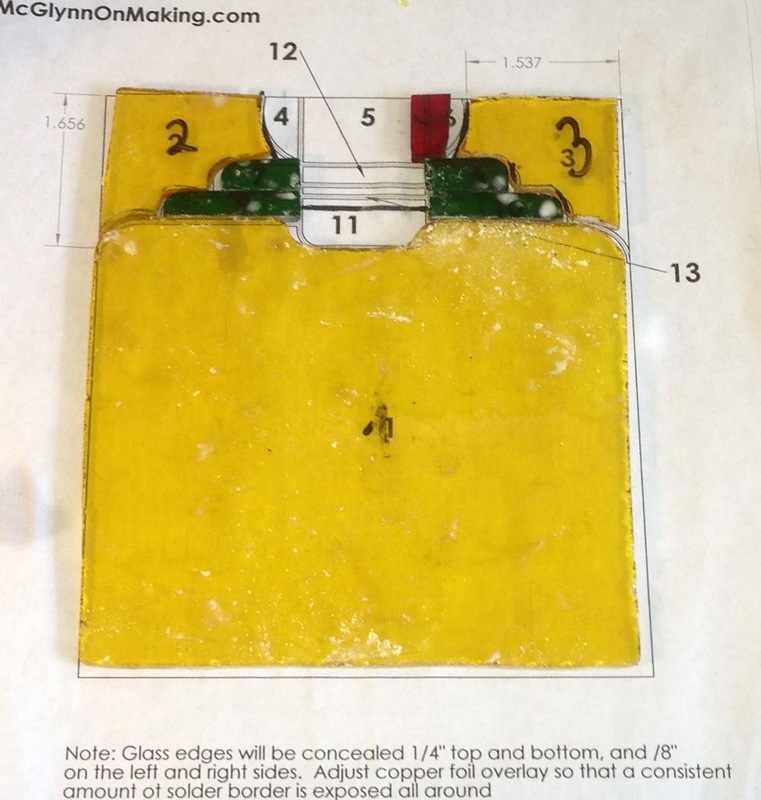 I started squaring up the stock for the stretchers – It’s kind of amazing how much resin has seemed out of these parts. Ick. 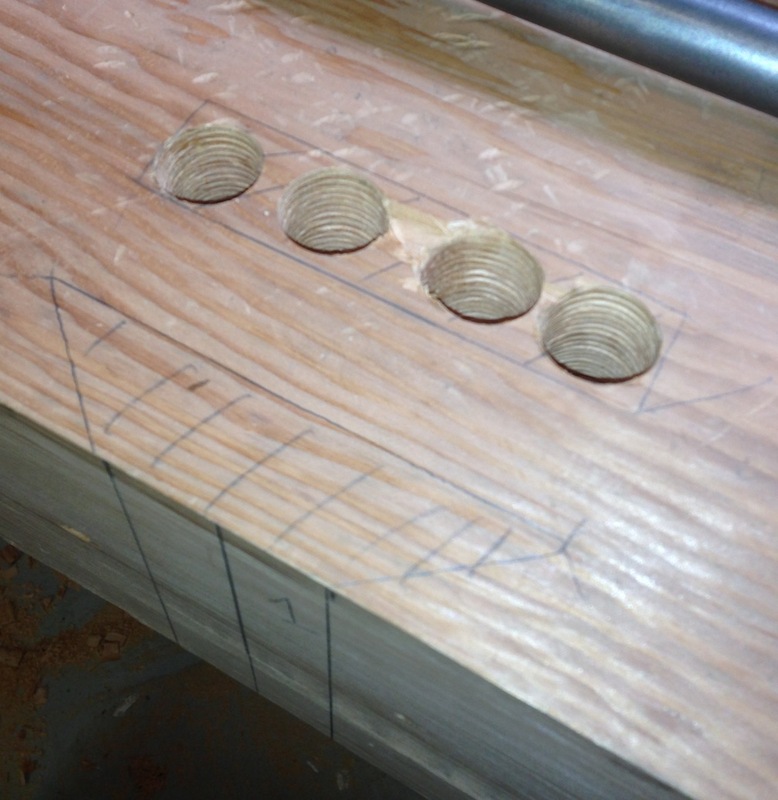 I started laying out the locations for the right side “end vise” on the bench as well as the legs. It’s all upside down in this picture, so hopefully I’ll get the end vise on the right end and the face vise on the left front. I think the first step will be to mount the vise. 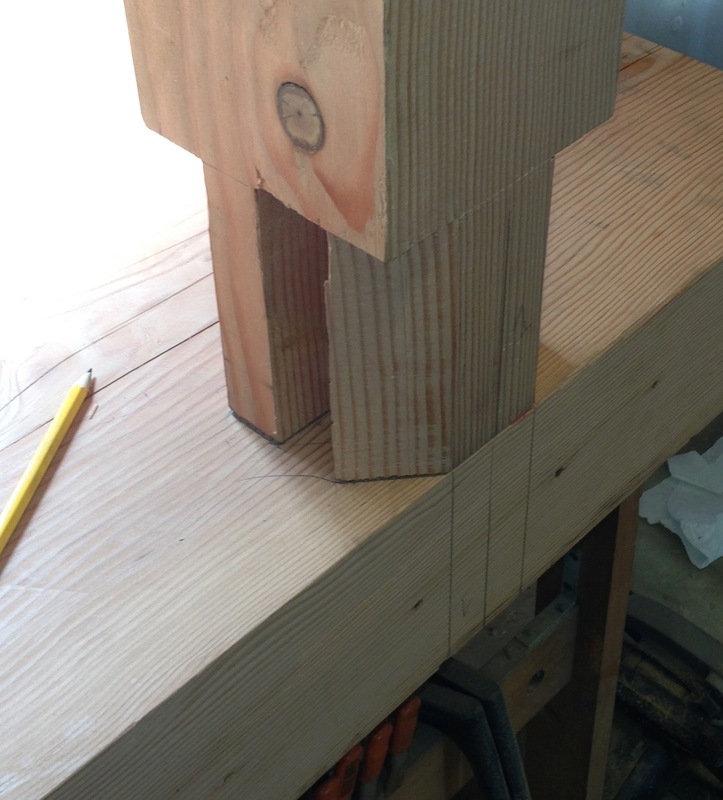 If I move it beck from the edge maybe 3″ the vise guide rods will be behind the leg, and I san move the legs more towards the ends of the bench – which should make it less tippy. 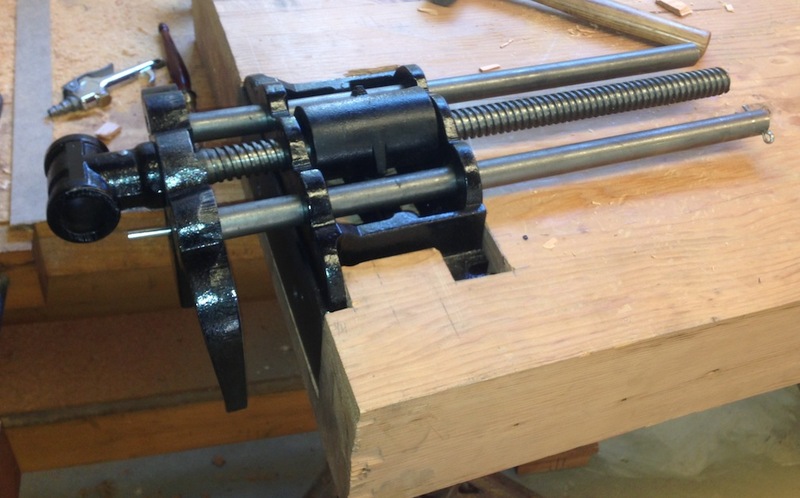 To mount the vise I’ll have to make a recess in the bottom of the bench, and in the end. I’ll get to work on that next. 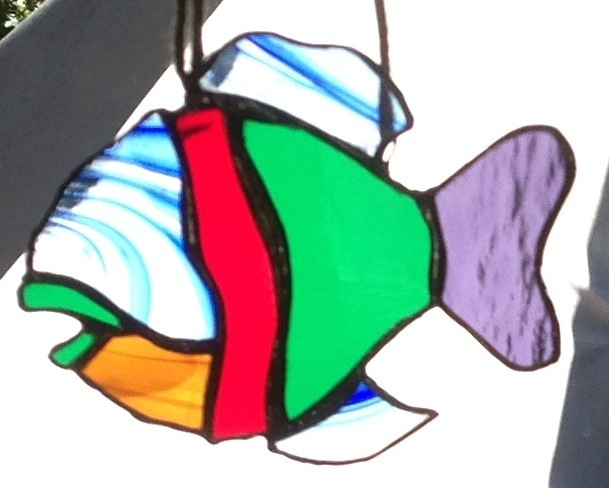 Next Saturday is the Stained Glass class, I’m looking forward to that. I have my patterns for the sconces, but I’m not sure I’ll be able to do those in the class as it’s probably more intricate that they want in a beginner’s class. We’ll see how that plays out then. I started on the drawers for my tool cabinet, but realized that I didn’t have enough wood for the job. I milled the drawer fronts from one piece of Alder I had on hand, but the other length wasn’t wide enough. I decided not to run to the local wood store because the weekend traffic in Santa Cruz is murder. Santa Cruz is a major destination for Bay Area folks in search of some beach action. Instead I’m going to spend the time I would have sat in traffic fine tuning my table saw and organizing my shops. 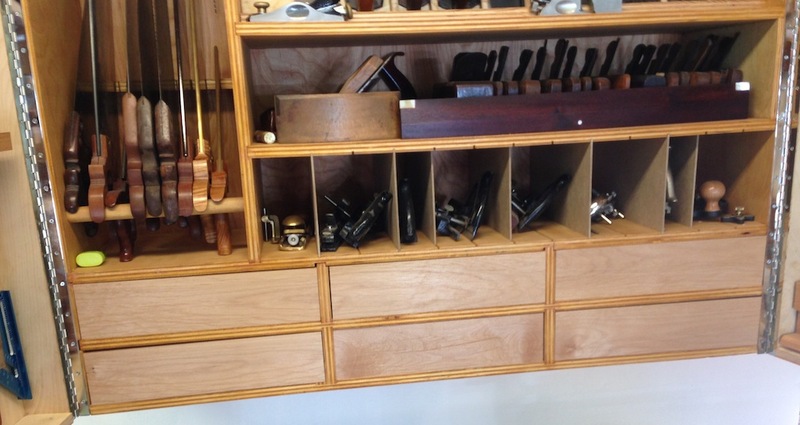 The wood shop is in pretty good shape, especially now that the tool cabinet is mostly done. I need to fix a leak in the dust collector ducting and do a little clean up. Then I need to do a major overhaul on the metal shop, luckily my son is on the hook to help me for a couple of hours. 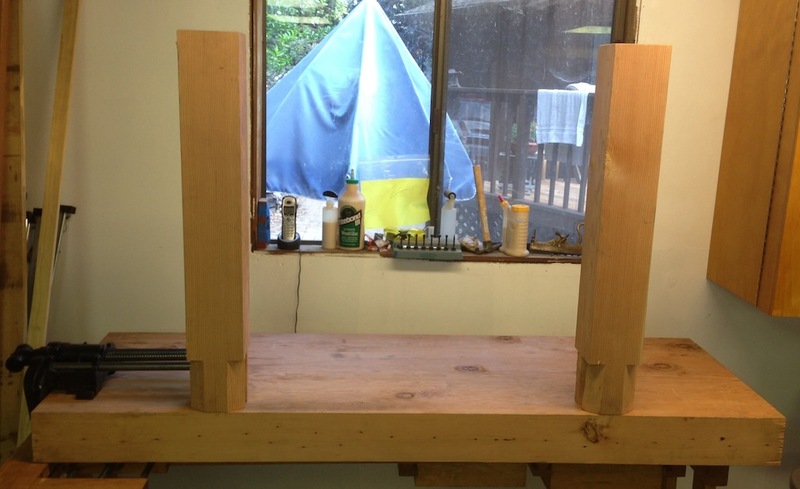 Along the way I’ll move the parts for my Roubo bench over to the wood shop so I can work on that later. 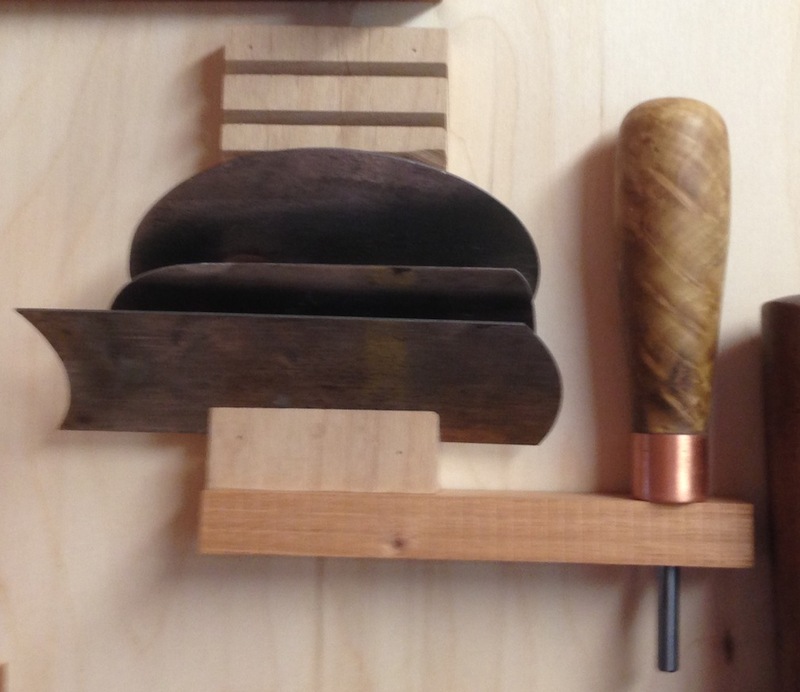 I just spent a couple of hours in the shop and finished off the hangers for my tools. 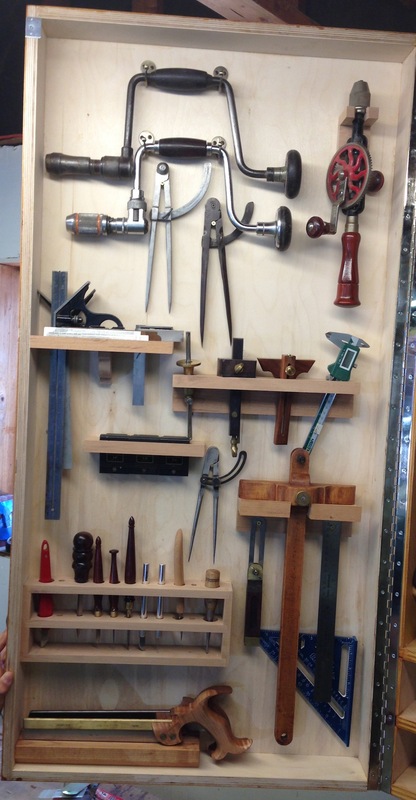 As a recap, I finished the main part of the tool cabinet a month or more ago, but had a bunch of tools that I intended to hang on the inside of the doors. I finished that off, and I’m reasonably happy with it. I’m planning on starting on the drawers tomorrow. I’ll probably use the router bit joint rather than dovetails — I want to finish this quickly and move on to more interesting projects. This is intended to be utilitarian. 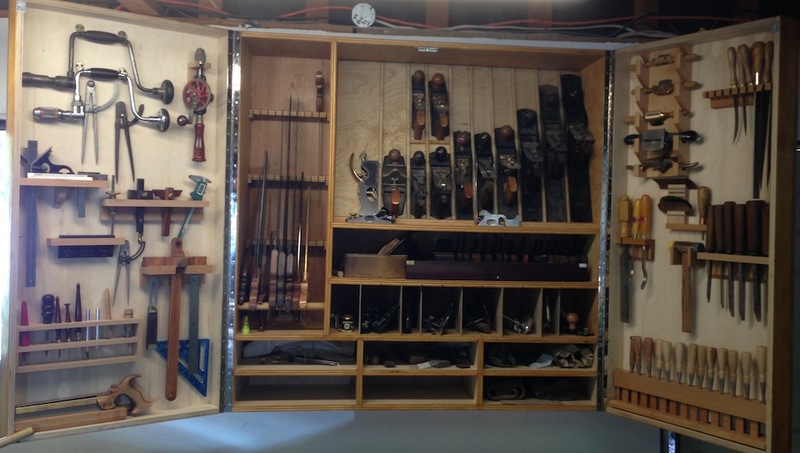 I don’t have a lot of other stuff to put in the cabinet – a couple of extra plane blades. One drawer will hold my auger bits. One will hold my carving chisels. That leaves three more for screwdrivers and other stuff. 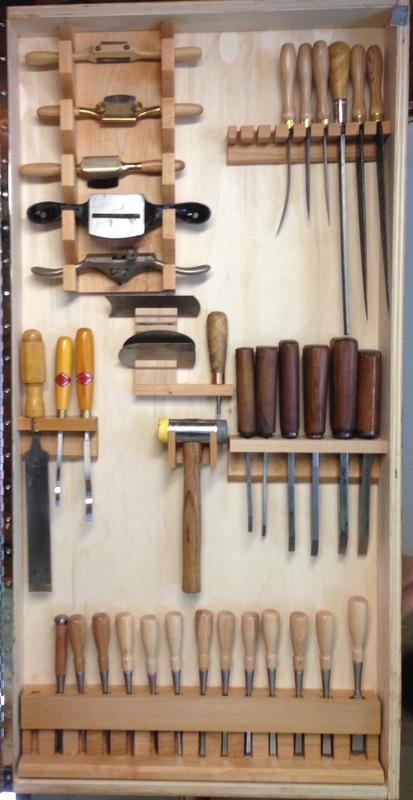 When I made the wall cabinet for my hand tools recently there were a few details I didn’t get finished. 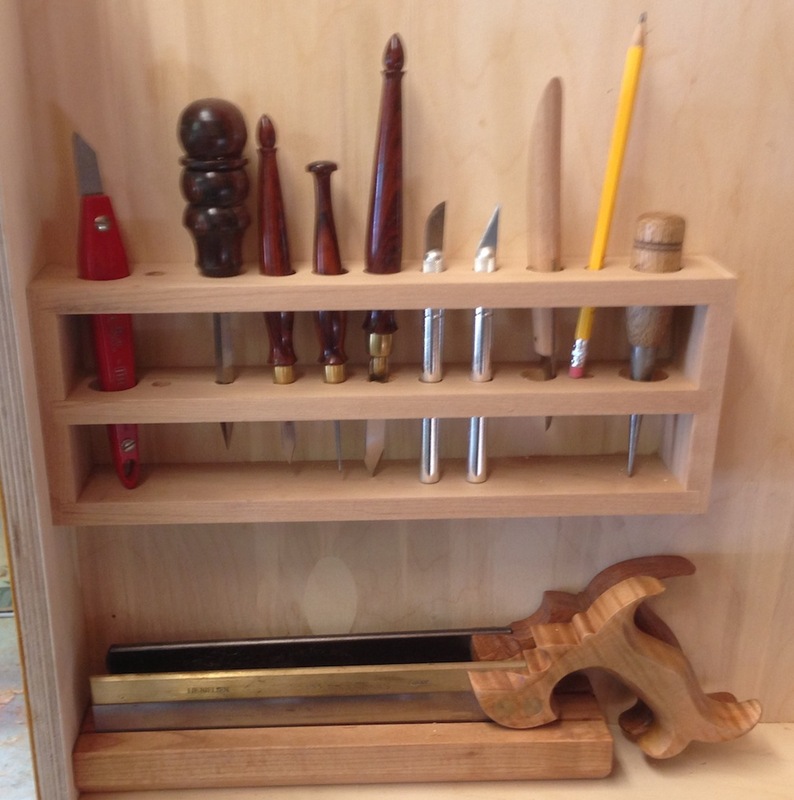 I had a small pile of tools that I intended to hang from the inside of the doors that I hadn’t yet made hangers for, and of course the drawers. 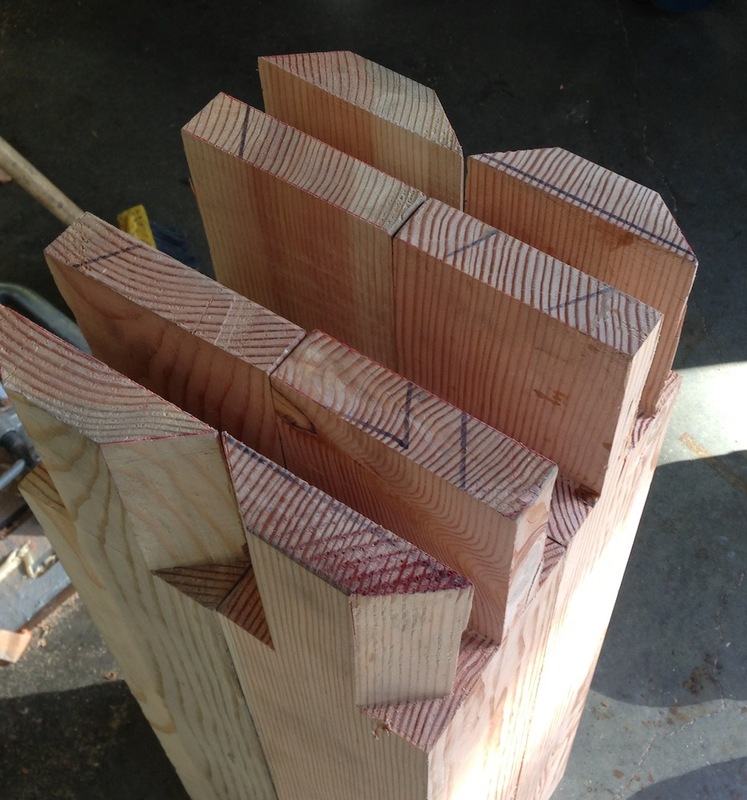 This past weekend I picked up some 4/4 Alder to make the rest of the tool holders, and the drawers. I’m still cogitating on the drawers. 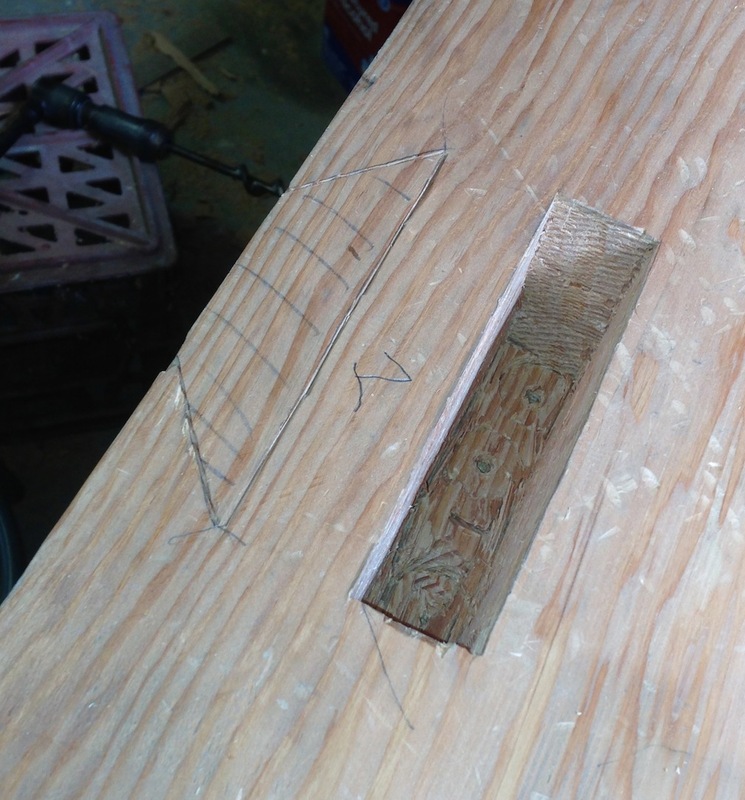 I have a “drawer lock joint” router bit that would probably make quick work of six drawers, and that kind of joinery would be in keeping with the down-home pragmatic construction I used on the rest of the cabinet (inexpensive shop-grade plywood, table saw joinery and biscuits). 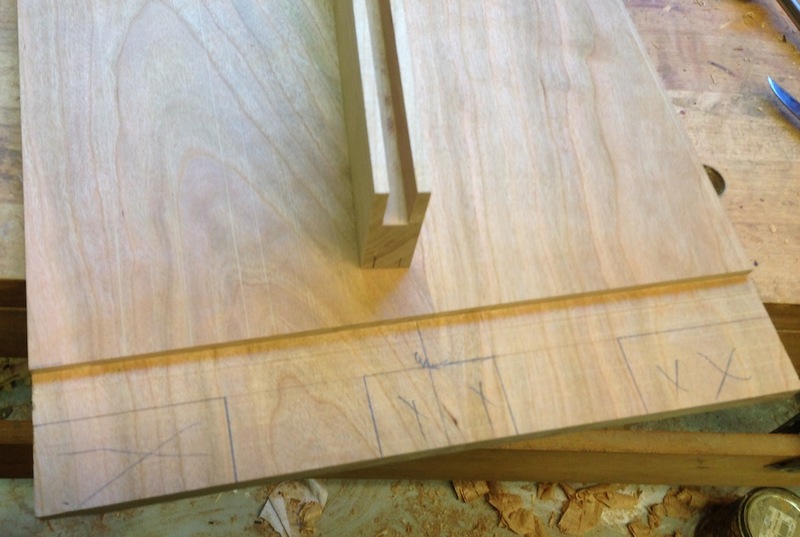 At the same time, it would be a great chance to practice dovetailing and making drawers. We’ll see. 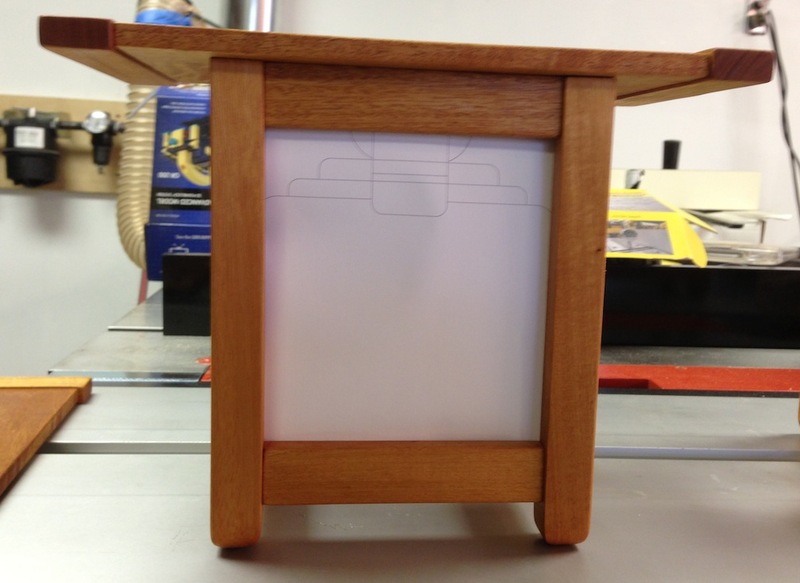 I still need to make a holder for my rulers, squares, and panel and marking gauges. By next weekend I should be ready to tackle the drawers, so I’d better have a plan by then. I needed some shop time today to relax and clear my head, so I rummaged around and found a scrap of Cherry. Nice color, but not enough to do much with. 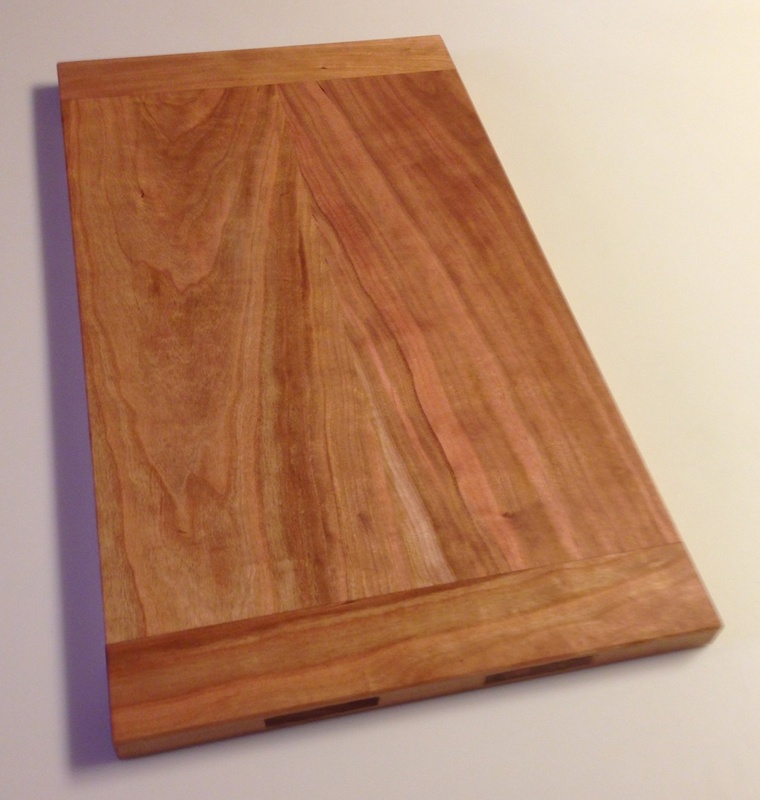 So I made a cutting board with bread board ends and through-mortises. 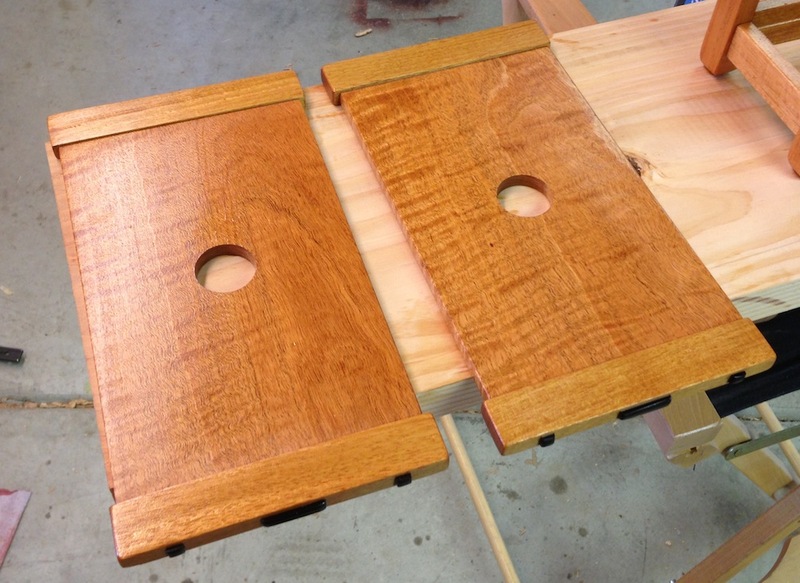 The mortises aren’t perfect, but they are snug and overall pretty nice.. I planed it all nice and smooth, broke the edges with a block plane and rubbed in a coat of (food safe) Tried & True Oil/Wax finish. I’ll give it another coat tomorrow while I clean up the mess in the shop and leave it to dry for a week. It looks nice and didn’t take long to do.